False positive spelling mistakes? Here is the solution. This is a funny problem which everyone suffers from. You send a proposal to a customer. The customer name is shown as a spelling mistake. Now you correct it on your PC by adding the name to your dictionary… now you think you have solved the problem… but it has not been solved. Your dictionary will not be traveling with the document. So on the customer’s PC it will show that name as a spelling mistake (unless customer has added the name to the local dictionary). Usually customer would add their own company name to dictionary – so it is not a problem. But on their PC, your name will be shown as a spelling mistake… that is a problem! In addition, many technical terms may be shown as spelling errors – which they are not. How do you solve this problem while knowing that you have no control over the custom dictionaries at the destination? The solution is intelligent and elegant. First of all, you must do a regular spelling and grammar check. No shortcuts available here. Having done that, you still have some spelling errors which are words not included in the dictionary – but in the context of your business domain, those are correct words. 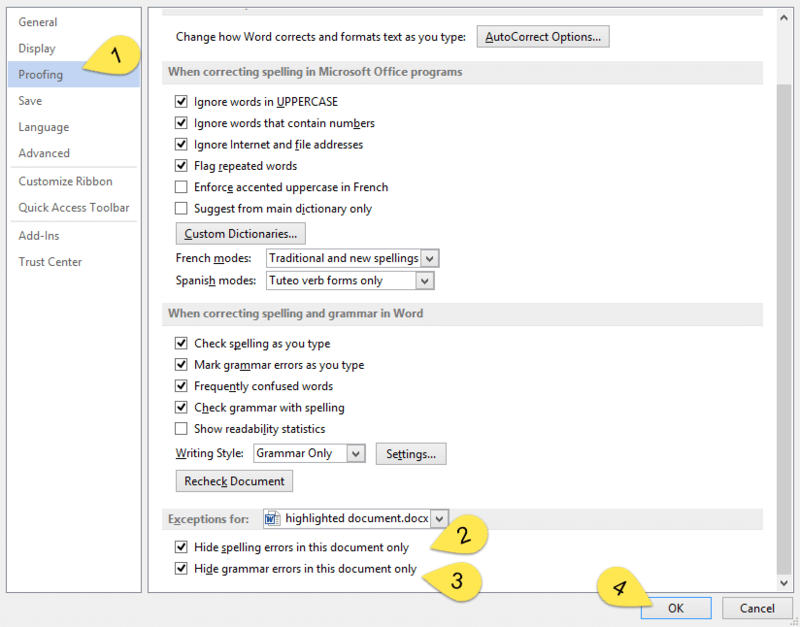 Notice that this setting is specific to the file. That means, it travels with the document. The mistakes will not be shown on ANY PC. Problem solved! 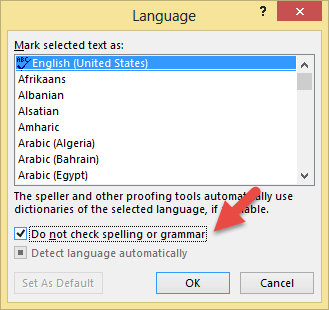 If you keep this setting ON all the time, you will not be able to notice genuine spelling mistakes as well. Therefore here is what you should do. This way you don’t have to worry about missing genuine spelling mistakes. Of course, what I showed above is a workaround. Word is NOT a workaround. It is a comprehensive solution to all our problems. This problem has also been thought of and an elegant solution given. Now whenever there is a word which is shown as a spelling mistake but it is a domain specific word or a name, select it and apply this style.